The following news release was issued this morning by the Confidence In Canada coalition, of which ICBA is a key part. While today’s announcement that the Trans Mountain Pipeline project will move forward in the national interest is encouraging, the recent events and the need for federal taxpayers to purchase this project have exposed fundamental flaws in the regulatory systems at all levels of government. 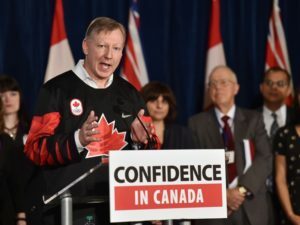 We cannot build confidence in Canada if we continue to allow our country’s economic assets and natural resources to be held hostage by obstructionist governments, misinformation or an inability to uphold the rule of law and project approvals. As we have said all along, this is about more than a pipeline. Our regulatory processes are fundamentally broken and continue to create uncertainty for communities, companies, employees, and Indigenous peoples. At risk is the ability to create jobs, attract investment and sustain overall confidence in the Canadian economy among large and small businesses and local and international investors. The time has come for a national conversation on how we can restore confidence in Canada. Natural resources and permitted sectors have and should continue to drive our economic prosperity, our quality of life and the innovations necessary to create a more sustainable, lower-carbon future. In the coming days, the Confidence in Canada partners from across the country will identify next steps and opportunities to advance the national interest and create certainty for Canada’s economic future. The letter signed by 114 business, labour and municipal organizations from across the country expressing support for restoring #ConfidenceinCanada is available here.